Fire breaks out at ZHC Science Block: How safe are our colleges? Wenger’s Bakery is perhaps one of the oldest and most well known confectioneries in New Delhi, and right around the corner, one shop away from the mighty Keventers is Wenger’s Deli. This week, we decided to see for ourselves if the Deli does in fact live up to the Wenger’s name. Situated in A block, Connaught Place, Wenger’s Deli is easy to reach and locate. The almost rustic charm of the bakery and a perpetually lively atmosphere make Wenger’s hard to miss. The Deli itself is a tiny outlet, with seating space for only about 8- 10 people. It looks tidy and hygienic, thanks to an open kitchen and neatly organized rows of delicious looking desserts. The menu at Wenger’s Deli is made up of a wide range of salads, burgers, paninis, waffles, shakes and verrines.. We ordered a Peri Peri Chicken Panini, and a Penne Arrabiata Chicken along with Silken Chocolate and Mocha shakes and a strawberry smoothie. Everything tasted really fresh and well made. While the mocha shake was slightly disappointing, the strawberry smoothie turned out to be a winner. The Panini, which is basically a grilled sandwich with an interesting bread/ bun, took us by surprise. It was quite wholesome and had us fighting over for the last bite. The Deli is a self- service restaurant, and our order was ready in a few minutes. The giant glass panels allow you to watch the master bakers at play in the kitchen, and also to keep track of your order. The menu is well- priced, with almost no item exceeding 200/- . One can satiate a hungry stomach, complete with a smoothie and a dessert at less than Rs. 500. If you are looking to grab a quick bite and are tired of the same old fast food chains, this is definitely a place to visit. There is quite a lot on the menu to choose from, but not enough sitting space, so make sure you don’t come with a huge group. 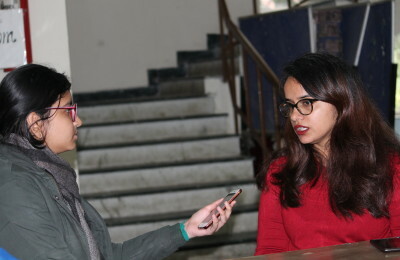 DU Beat is an independent student run newspaper based in Delhi University. One of the largest campus publications in India, we are strong believers of Freedom of Expression. Follow us for news, analysis and opinion from Delhi University and much more for the student community! Subscribe to the DU Beat Newsletter!